This photo of Tarpots corner shows the junction controlled by traffic lights before two mini roundabouts were put in. Later the roundabouts were removed and the traffic lights that are there now were installed. 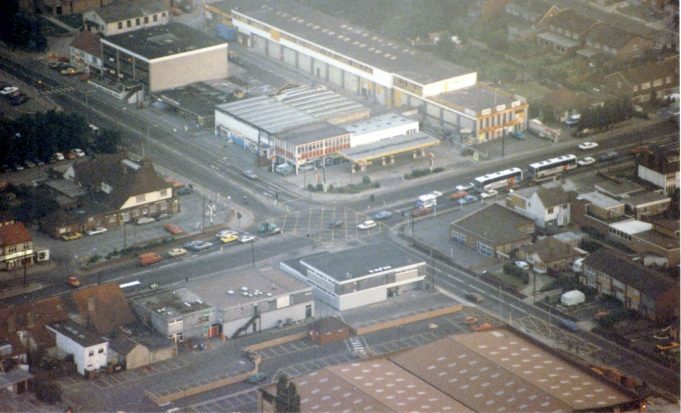 The building at the bottom of the picture is where the Aldi store now stands. It is believed to have been a DIY superstore at that time – does anybody remember the name then? Compare this photo with an earlier aerial view when Essex Carriers had their depot on the north east corner of the junction. The person that attended the DIY shop opening, when was this please? The service station on the corner was called TEXACO, it was knocked downt 2008, flats are there now. Hi Sorry but it never was a Texas, it was Pay less DIY originally…I remember the opening day, which was delayed by a bomb scare. At the time, I worked at S&D Hardware in the nearby Church Road Shops. I went from there to work at the nearest Texas Homecare which used to be at Stadium way, Rayleigh. Ironically there are two coaches from Supreme Coaches in the picture also, I went on to work for them also! Also before Pay Less DIY, the courier firm was Atlas Express. Macs cafe used to be next to the garage on the corner we had a massive garden! Now it’s all that building. Originally it was TEXAS,(the big one)70s to 80s, then Do it All, (Why do , do it all do it), then Pay Less.